A Christmas Reflection - How Great It Was To See You! I am always here - 24 hours a day, seven days a week, 365 days a year - waiting for you. But generally I am alone, abandoned and ignored. 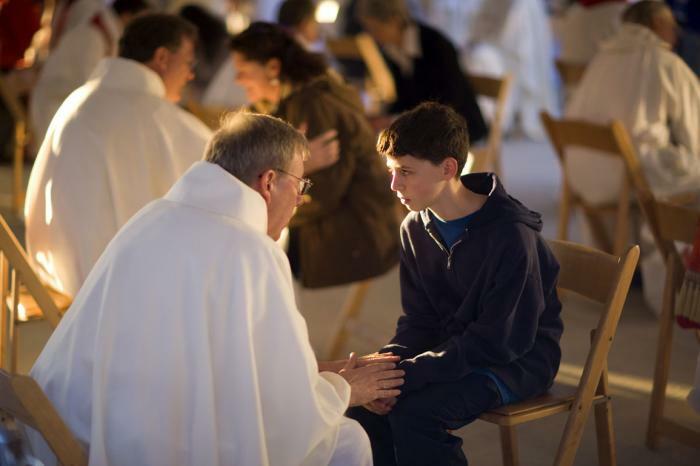 Through the Sacrament of Reconciliation, grace can be restored to our souls. CANASTOTA, NY - So when I looked out from behind the closed doors this morning, I was overjoyed to see you - so many of you. While there were many familiar faces among those filling the pews, there were a good number whom I have not seen in some time. If you only knew the joy I experience when you come! The Sacrament of Reconciliation is one of the most unique and beautiful aspects of Catholicism. Jesus Christ, in His abundant love and mercy, established the Sacrament of Confession, so that we as sinners can obtain forgiveness for our sins and reconcile with God and the Church. The sacrament "washes us clean," and renews us in Christ. It really isn't that difficult. I already know where you have failed Me, yourself and others. There is nothing you could ever tell my priest that he has not heard or that I have not forgiven through him countless times before. Truth be told, fewer come to see Me in the confessional each week than visit me in my locked tabernacles! Pride caused your first parents to disobey me and the same pride keeps so many of you away from Me! Swallow your pride! Humble yourself. Come to this place of forgiveness, healing and mercy - the source of new life. I can not shower you with the graces I have for you in Holy Communion unless you do so. I am sure you can understand then why your absence from Sunday Mass and the confessional saddens Me so! There is rarely any valid reason for you to miss Sunday Mass or for you to approach Me in the Blessed Sacrament unworthily. A blog through which I promote zeal for the salvation of souls, awe and amazement for the Holy Eucharist and Eucharistic Adoration, and fidelity to the Truths of our Catholic Faith.